In 2010, IZZO managed to pull off a remarkable milestone by lancing their top-brand 'TIMBRA Top Percussion'. 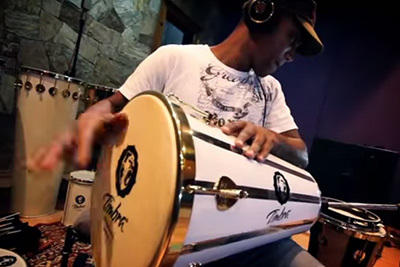 All TIMBRA Samba instruments have been developed in close cooperation with renowned percussionists. The objective was to create convincing series of instruments with great sound, optically outstanding and adecuate for stage gigs. Especially the timbals, made of either wood or aluminium, set new standards with their 16 tuning hooks, extraordinary design and spectacular sound. 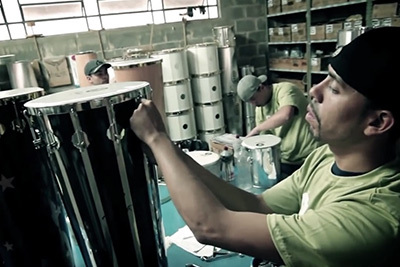 Naturally, all other Samba instruments are included in their repertory, such as wood or aluminium surdos, cuicas, rebolos and tantans. Real eyecatchers are the timbals and bacurinhas with extravagant and colourful designs from the Carlinhos Brown signature series.